This project was driven by the determination to find a way of displaying an overview of significant data from the Victron equipment fitted to my campervan. 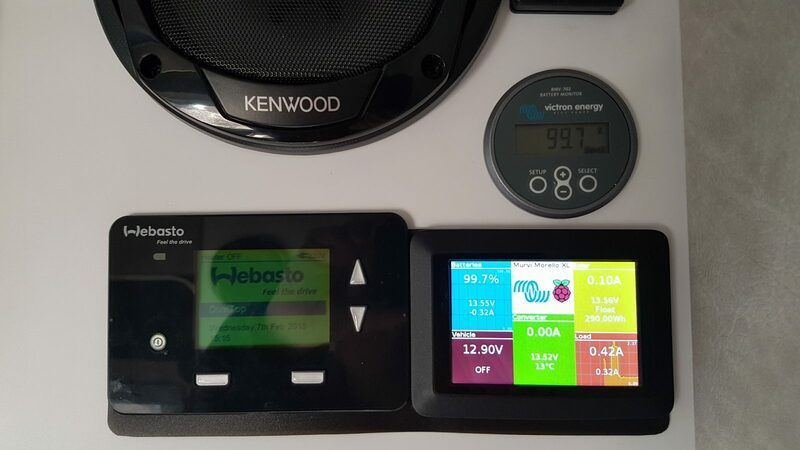 My original installation included a BMV battery monitor and a MPPT Control which allowed me to obtain readings from the system but the limited display sizes meant that many button pushes were needed to get a complete overview of the system. Victron do offer the Color Control GX display unit which addresses this issue but in the context of my installation it was a very expensive solution with far greater functionality than I needed. Inspired by Izak Burger’s successful of the porting of the Venus GX software used by the Color Control GX to a Raspberry Pi I decided to investigate Victron’s open source software and communication protocols to see what I could do to address my specific needs. 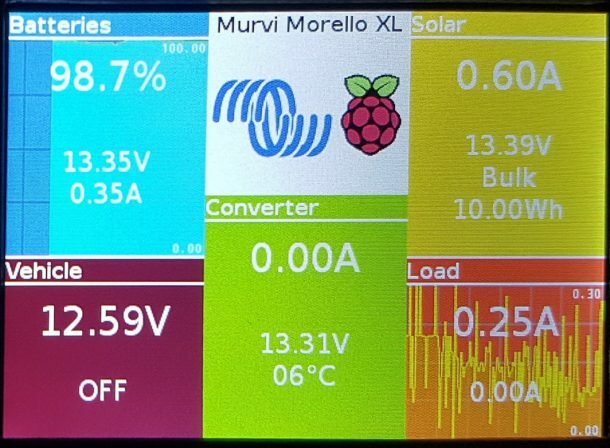 After much research and patient trial & effort I came up with this recipe for victronPi – a RaspberryPi driven display showing a ‘real-time’ overview of the data from the Victron equipment installed in my campervan. Sadly Victron where not able to provide any documentation of communication protocol used by the Buck-Boost Converter so this had to be derived by other means. I do not have any great expertise in coding so no doubt there are many rough edges and it many not be the most efficient way for achieving this end result but it works for me. However any suggestions for improvement will be gratefully received. Check settings in raspi-config to ensure SSH is enabled, localisation in correct and password set. Download the project files from ftp://majora.dynu.net/Projects/victronPi/project.zip into this new folder. I incorporated a UPS PIco HV3.0B HAT Plus into my setup because of its ability to power the Pi directly from the 12v system and to provide RTC, relay and ADC functionality which could be useful in future projects.